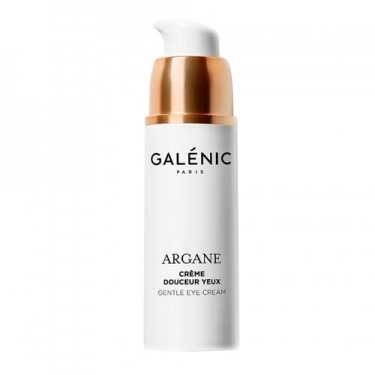 DESCRIPTION: Argane Crème Douceur Yeux from Galénic is a delicate eye cream that provides intense softness for a younger look. 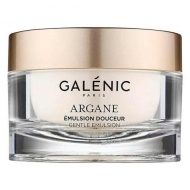 Rich in argon oil, this formula offers a perfect balance of generosity and softness to deeply moisturize the most delicate areas. Considered a true "desert gold" of Morocco, argon oil is a rare active ingredient with nutritional qualities as well as exceptional restorative and antiaging properties. 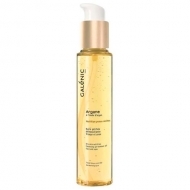 In addition to argon oil enriched in vitamin E, it nourishes, moisturizes, regenerates and protects the skin from free radicals, also contains argon peptides, which stimulate cell renewal. 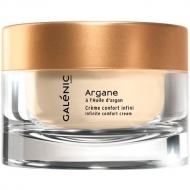 Complete Formula: Water (Aqua), Caprylic/Capric Triglyceride, Pentylene Glycol, Butylene Glycol, Mineral Oil (Paraffinum Liquidum), Sucrose Distearate, Argania Spinosa Kernel Oil, Ethylhexyl Palmitate, Squalane, Sucrose Stearate, Dimethicone, Peg-12 Ammonium Acryloyl Dimethyltaurate/VP Copolymer, Argania Spinosa Extract, Beta-Sistosterol, BHT, Fragrance (Parfum), Phenoxyethanol, Sodium Polyacrylate, Tocopherol, Tocopheryl Acetate, Yellow 5 (CI 19140), Yellow 6 (CI 15985). Apply morning and / or evening to eye contour.